Applications are hereby invited in the Standard Forms from the intending candidates who have passed the 6 (six) months recorders Classes Coures Certificate from the Assam Survey & Settlement Training Centre, Dakhingaon, Assam only and Citizen of India and permanent Resident of Assam for filling up of 34 (thirty four) nos vacant posts of Mandal of amalgamated establishment of the Deputy Commissioner, Golaghat. 27 (twenty seven) posts unreserved. 1. Candidates must be HSLC Examination or its equivalent examination passed. 2. 6 (Six) months RCCC training passed. Age: candidates must not be less than 18 years and not more than 38 years of age as on 1.1.2018. The upper age limit for candidates is relaxable as per existing Govt. rules. Pay: Pay band (PB2) 14000+6200= 49000 PM other allowances as admissible under rules. Application Fee: The application should reach the undersigned by 17.03.2017 from the date of publication of the advertisement with a treasury challan of Rs. 5.00 (five) only under the Head of Account "0070" OAS (Examination fees etc). For SC/ST candidates a Treasury Challan of Rs. 2.50 (Rupees two and fifty paisa) only need to be attached. How to apply: The Candidates must apply in the Standard Form alonwith copies of all testimonials and 3 (three) copies of recent passpost size photograph duly attested by a Gazetted Office in an envelops of Size 25 CM x 11 Cm. One self addressed envelops should be enclosed. 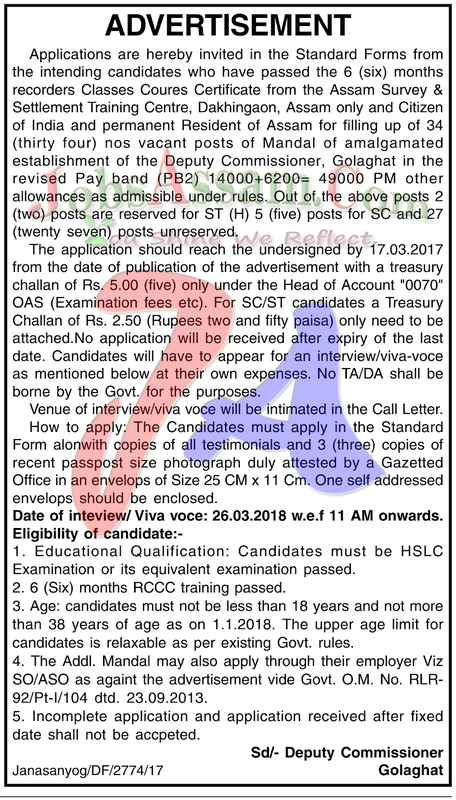 Date of inteview/ Viva voce: 26.03.2018 w.e.f 11 AM onwards.